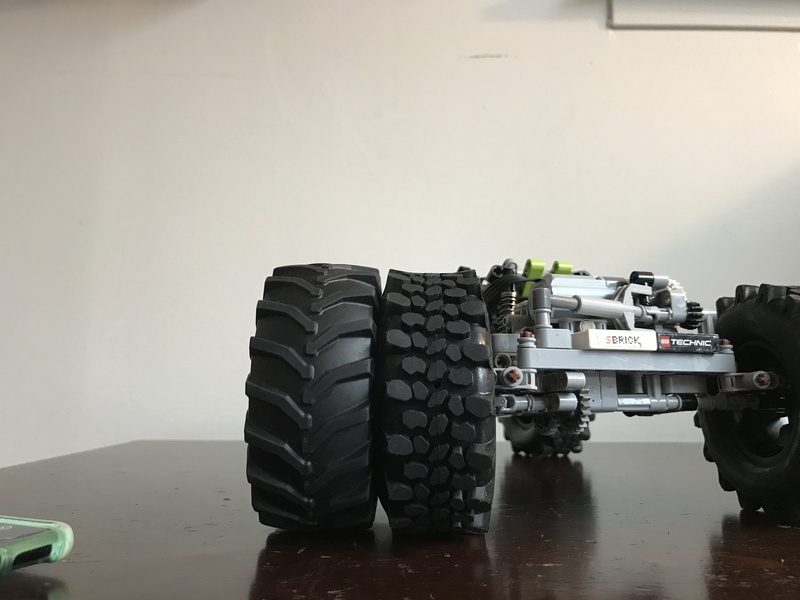 Here is the successor to my Lego Technic Chili Crawler, the Cactus Crawler It took about half of a year of design and revision to reach its current state, of which I am proud of. - BuWizz for extra power and SBrick for a great, custom control scheme Note: By the time I finished designing the cab and it's battery enclosure, BuWuzz had not yet come out with the update for their iOS app that allows a single joystick/slider to control multiple outputs, so I was forced to use an SBrick with the BuWizz, providing the extra power from the BuWizz, but with the ease-of-use and great custom control profiles of the SBrick. When used with the SBrick, the BuWizz does in fact still provide more power than the standard Lego 8878 LiPo battery box. LXF hopefully coming soon, the tires can easily be found with a quick google search of their name. YES, I know, there is no body. This is meant for performance, meaning I made the cab as small, light, and rigid as possible. I will be able to reply intermittently throughout the day. I figured I'd put this up now anyway! Two motors for the back and one for the front? Interesting. Innovative....don't think I have seen that before in a Lego crawler. Much faster than previous versions. Looks like it helps with the crawling quite a bit. Wow... So much speed+power on this beast!!! Needs some color though... Video is great, I have actually been to that part of the water front in New York. Which beach were you at? Nice work. Would like to see some closeup pics of the suspension linkage. Like the steering approach with the actuator too. Excellent performance, comparable to Hobby grade competition crawlers in pure climbing ability. Thanks! It was in Brooklyn, near the bridge. There are a lot of great areas to film there, especially recently since they have now renovated, adding lots of great rocks for crawling as shown in the video. This is actually where I filmed most of my shots for my Unimog Trial Truck. I, too, like my steering solution. It provides a great turning radius, rigidity, and a decent speed. The only downfall, however, is that the plastic linear actuators cannot handle too much torque and, thus, slip quite often. There is absolutely nothing I can do about this, however, with the only solution being lego designing a more heavy-duty LA of the same size. Thank you, that is what I am aiming for! What about this LA? Too long? Yup, definitely for this crawler. 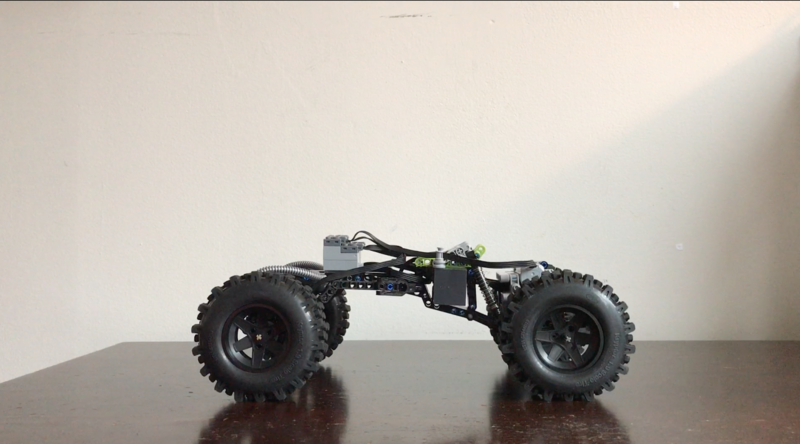 I've even tried working it into the steering for larger crawler projects but its size makes it very difficult. Great crawling, fast and agile however could do with some bodywork will you be adding any? Nope, I'm not doing body work as it would, in one way or another, detract from its performance. I search at the moment for a good performance crawler, and this one is absolut number one on my list. Did you support us with a LDD and or instruction ? First of all, may thanks for the design and instructions. I've been somewhat a smalltime technics parts collector a few years ago before going into into a dark age until I chanced upon these RC crawlers recently. 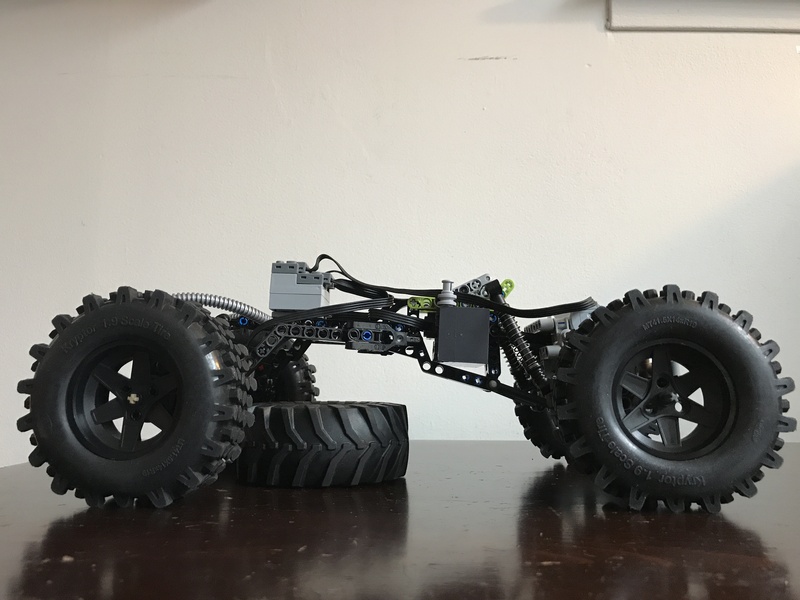 After looking around abit, I've found that your Cactus Crawler seems the "easiest" to get back into the game since it came with instructions(great video btw), and did not require too many parts compared to other alternatives so I decided to give it a go. Here is what I have right now, mostly with parts from my old(circa 2013) collection. After 1 order from BL, I'm now just missing a buwizz, some nicer wheels, 1 more L motor, and possibly a few more parts to get it a little more colour coordinated. I must admit, this took a little longer than I expected, especially seeing that this is my 2nd try at PF(the first involving santa and some reindeers :o), and this is what I have got now. 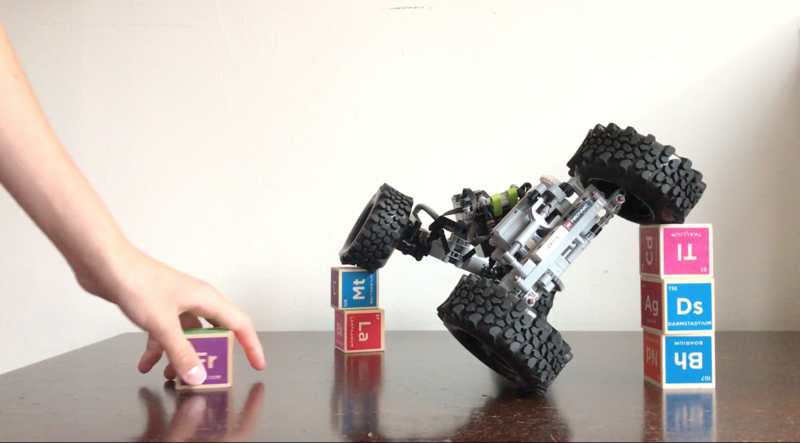 I then tried connecting the green piece to the suspension only to get a suspension that flexes before it could compress, the suspension refuses to compress when I pushed the body of the crawler down. I tried reviewing your video several times but this part was somehow always hidden or in shadow. I started to change around the mounting points to see what the issue was and finally realised that the "angle" the crawlers body pushed down onto the suspension seems wrong. I then tried a few different parts from my bin and finally found the 15100 Technic Pin Connector hub which then fixed the problem! 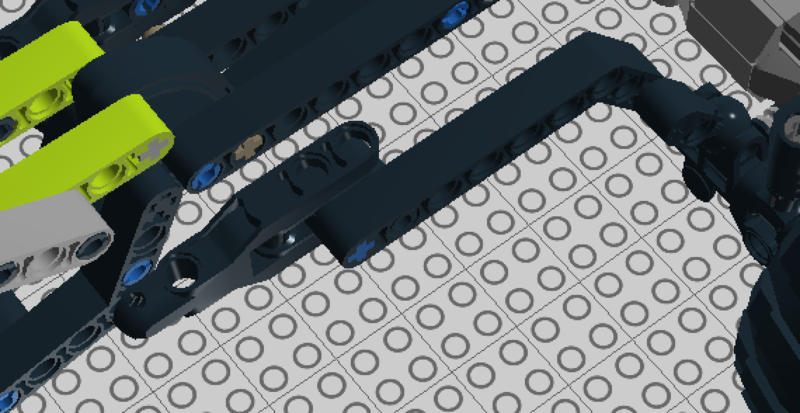 I then tried connecting the green piece to the suspension only to get a suspension that flexes before it could compress, the suspension refuses to compress when I pushed the body of the crawler down. I tried reviewing your video several times but this part was somehow always hidden or in shadow. 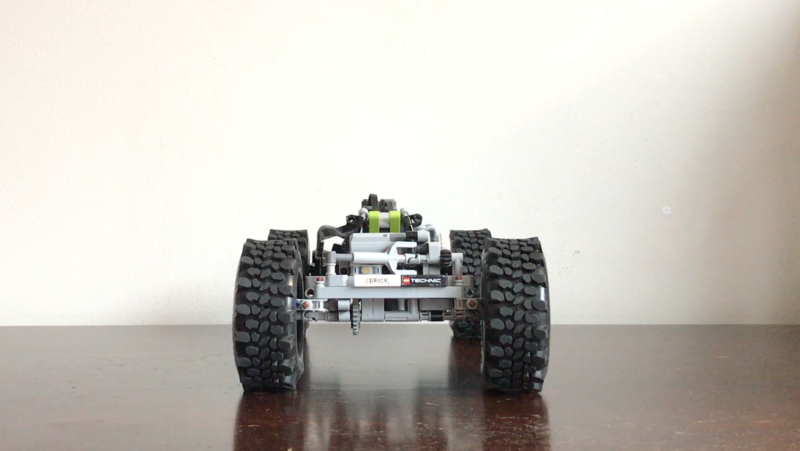 I started to change around the mounting points to see what the issue was and finally realised that the "angle" the crawlers body pushed down onto the suspension seems wrong. I then tried a few different parts from my bin and finally found the 15100 Technic Pin Connector hub﻿ which then fixed the problem! 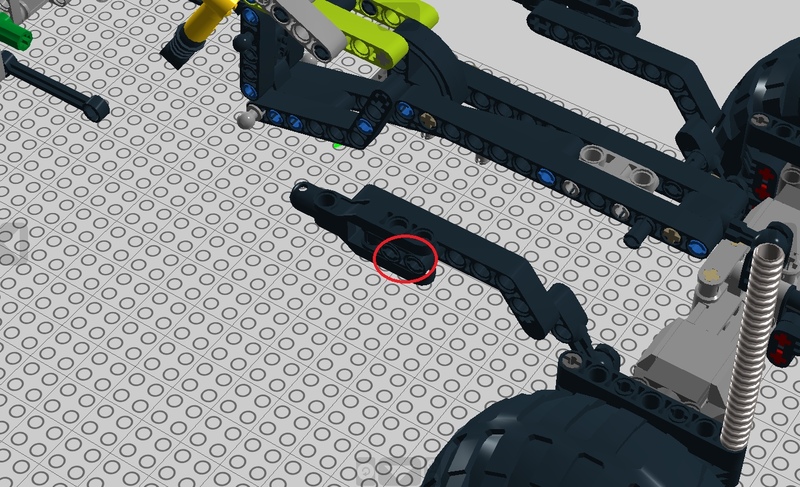 You are 100% correct about using the 15100 Technic Pin Connector Hub piece instead of the green piece. I inserted that green piece (and colored it the standout green color) because Lego Digital Designer - or at least my version of it - did not have the 15100 piece which is, in fact, the correct piece to use there. Nice job, I probably should have made public note of that somewhere . Anyway, I am delighted that you chose my Cactus Crawler to build. Please let me know if you have any other issues and I'd love to see the end result! Thanks for the reply! Yea, I suspected just as much, but also had some fun in trying to figure out what went wrong. Didn't realise that my 2nd photo wasn't posted, here it is showing a LBG 15100! 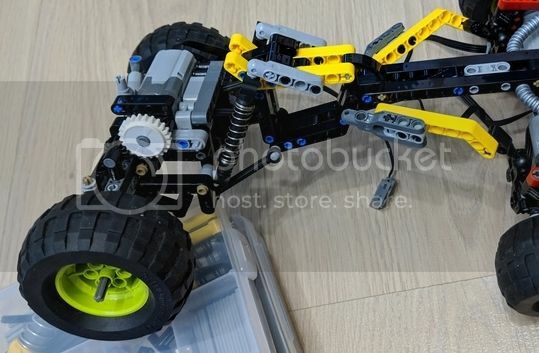 BTW, I'm really new to this, but I believe the 2 rear motors should be connected to the same(one in reverse) remote "channel" while the front motor should be to another "channel", and the last being the steering motor right? 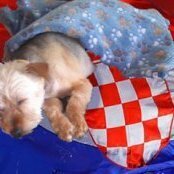 As I still do not have the buwizz(on order, black friday deal! ), and still short of 1 L motor on the front, in its current configuration(2 L motor for the rear and 1x M for steering the front, I am having quite a lot of difficulty maneuvering it via a AA battery pack+ remote control. Is this to be expected with the weaker power source+lack of FWD? I also found the current setup rather challenging to steer indoors, and a little slow on flat ground and I am not sure if it is because it was meant more for crawling, or do I just need more practice :) ? I find the turning radius a little wide and have the tendency to cause the LA to clip/clutch about 75% of the time when I'm trying to make a not so tight turn. Kinda frustrating right now but then again its not fully complete yet so I'm not sure if its worth "practicing" more in the current configuration? This is a build I would highly recommend for anyone keen with offroad/trial and has the parts to do so. It gave me many positive emotions! 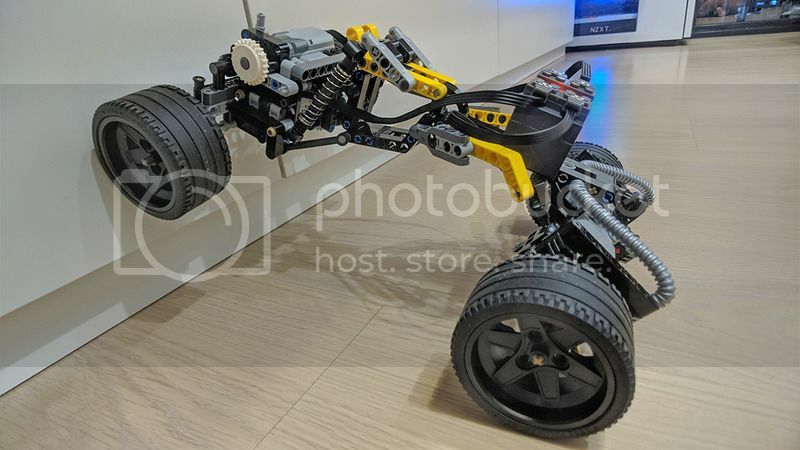 The way rear axle is connected is pretty weak. When you accelerate and then go backwards - had it disconnected quite a lot of times. Thinking that a couple more 1x6 links wouldn't hurt here or something similiar. It also disconnects a lot when you are half across the obstacle and rear wheels start to climb, but I am guessing that's because I am using tractors. Yes, it is. Buwizz's 11.2V speed it up quite a lot. As well as + forward wheel drive. Since it has no differential and the turning angle is not small, big wheels tend to bend on the axle and row (jump up and down). Adding drive to front wheels won't solve it completely, but it will definitely be better. Steering through small LA requires practice. The clicks you hear are also normal for small LA - protection in utmost positions kicks in, no gears are getting damaged. I just use it as a sound indicator that wheels are turned. Adding buwizz will also add speed to the steering, which it has more than enough. Ok, lots of questions. 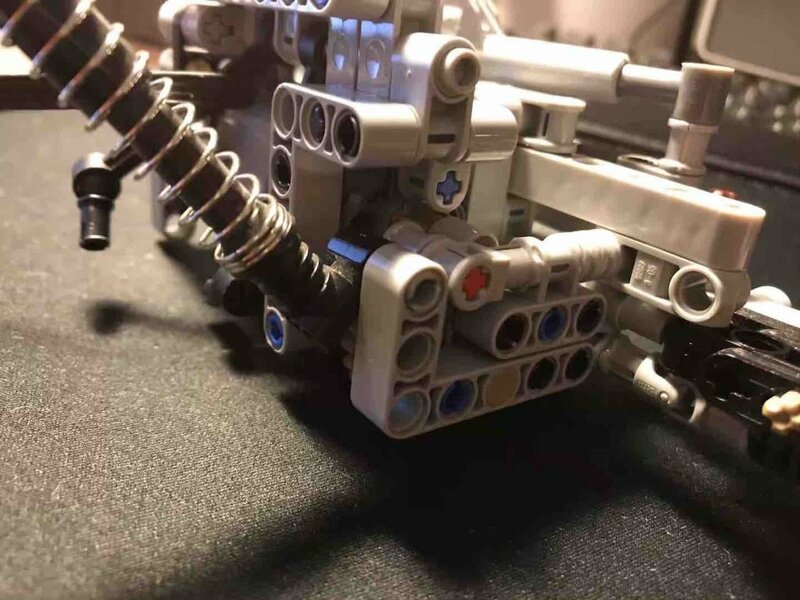 The two rear motors are facing opposite directions, so they do need separate ports on the Sbrick so that one can be reversed. The AA battery pack is larger, heavier, and less powerful than the buwizz, so it is certainly expected to perform worse. 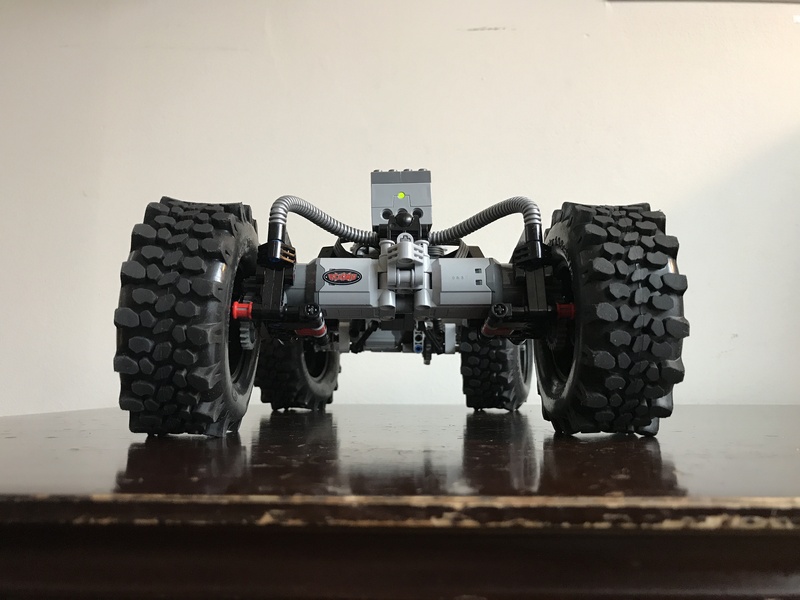 It is slow not only because of the AA battery pack, but also because it is a rock crawler - geared down for maximum torque over speed. The BuWizz will give it a noticeable speed and torque increase. The small Lego LAs are unfortunately weak for this application. 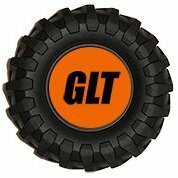 They should be able to turn the tires completely without slipping, however. Perhaps the Lego tires are too grippy on the hardwood/carpeted floor. I think I see the issue. The LDD file has the two rear links incorrectly swapped with each other. In other words, the right link should be on the left and the left link should be on the right, the towball levers would have to be flipped so that the towball pin would be facing inwards towards the chassis. 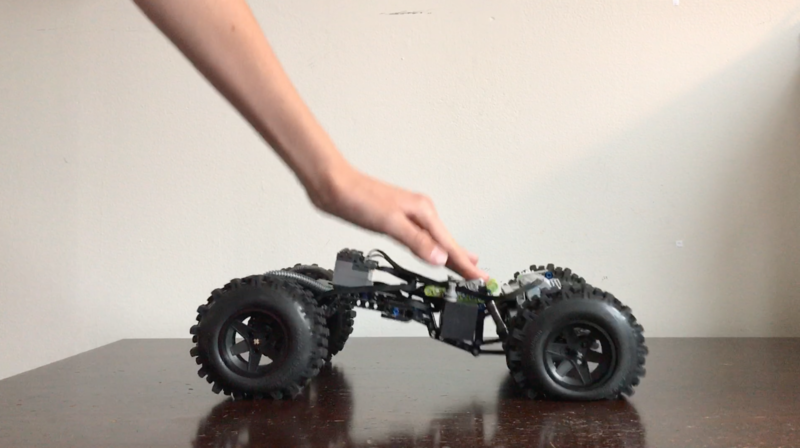 I'll post an updated LDD file tomorrow, but if you pause at the 1:39 mark on my Cactus Crawler youtube video (https://youtu.be/IyxIwBCkZ2s?t=99), you can see the correct construction, orientation, and placement of the rear linkages. This should resolve any weaknesses in the rear axle. Let me know. Yes, ultimately I had to decide between more ground clearance with a BuWizz and an SBrick or worse ground clearance with just a BuWizz. Because, at the time, the BuWizz app was extremely limited compared to the SBrick app, I chose to use the chassis that included the SBrick - the one that only allowed two of the four BuWizz ports to be used. I'll see if I can find pictures of the other chassis designs that allowed all four BuWizz ports to be used. The LDD file has the two rear links incorrectly swapped with each other. Steering arm should be 2 pins to the left. Having watched they video again, I think this model really benefits from soft rc tires imitating deflated pressure and thus increasing grip. Lego tractors are much harder. I am planning on building something similiar from scratch, got any hints for v2 or mod? Soft RC tires do help. I used the RC4WD 1.9" Kryptons without foam inserts. Just received the buwizz within 3 days, and the last L motor have also arrived and it is probably the most challenging(at least for me) to fit in the front L motor after having the chassis already fixed together. Took a while to tinker and finally got everything to fit, except for the buwizz. I believe this is due to how my connections were arranged to make use of all 4 channels on the buwizz, and the pf connectors made the buwizz block too thick to fit into the compartment? From reviewing your videos, I believe you managed to fit the buwizz in because you only connected a SBrick to the buwizz? Without wanting to tinker anymore this evening, I just stuck the buwizz on top so that I could fire up the crawler for a quick spin with another set of wheels I found in my parts bin. True enough, the speed/power was on another level, and maneuvering is also much much better with the front motor. The power together with the grip of the tires allowed it to "crawl" up my cabinets and stay in position! As this is also my first experience with buwizz, and after some experimantation, I've found that it was easier to control by setting up the 2 RWD motors(one in reverse) linked to the vertical slider for the left thumb, and the FWD motor+stearing motor linked to a small joystick on the right thumb. This way I can control the FWD and RWD separately and still have easy control to steering. So far only tested it within the confines of my room, but I've already been looking for things to "throw under the wheel" ! One question though, the flexible hose at the back is really taut and is already on the brink of disconnecting/bending 90deg. I've reviewed the LDD and couldn't find any mistakes and yet yours appear to have a smoother and more gradual curve to it? Did I get the hose length wrong? Once again, many thanks to PTNYC for the fun build! I have identified the cause of the hose length and rear axle rigidity issues you are having. The LDD incorrectly shows the rear links as being shorter than they should be. The picture below shows the CORRECT setup used in the video. The difference is that the rear links are essentially as long as they can be. Sorry for the confusion, LMK if this helps.